We have big ideas for the new garden space behind the computer science building (6050 University Ave.)! Some of these ideas include mushroom logs hanging from trees, a solar panel for the shed (YEAH! 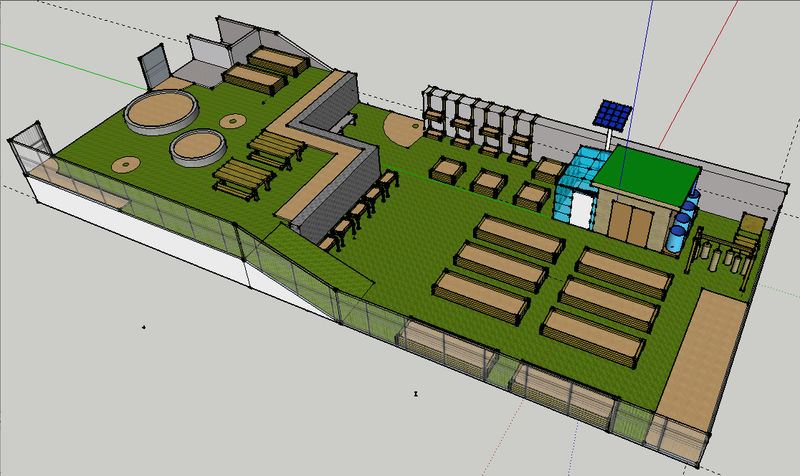 ), a green roof, a greenhouse, a slew of rainwater barrels, and lots of raised beds. We also want your input! Let us know what you think about the new design (way to go Rob!! ), and if you have any concerns or comments. The retaining wall must stay (please keep in mind we have the university administration to contend with), but we are still open to suggestions at this point otherwise. So far we planted 2 fruit trees (stella cherry and macintosh apple). The cold frames sadly had to be removed after they had served their purpose, but we have a clean slate to work with now (and we are getting a real-live greenhouse for next year!!). We are hoping to start construction of the shed in August with Community Forest International (http://forestsinternational.org/).